All those social networks we spend more than half our life on? There all just varying degrees of the same damn thing. 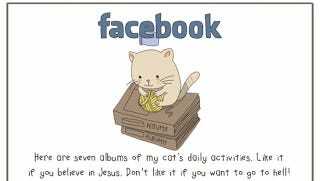 Basically, look at my cat's albums. Watch my cat videos. Read how I hashtag my cat. Check this filtered cat. And on and on we go. According to Devin made a hilarious comic on how each social network can be defined. It's so true. I want that GIF of a cat riding a scooter for Tumblr, please.